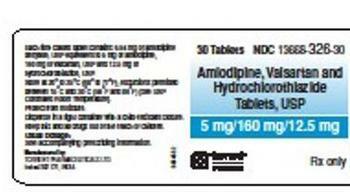 Torrent Pharmaceuticals Limited is recalling 14 lots of Valsartan/Amlodipine/HCTZ tablets. Trace Amounts of N-Nitrosodimethylamine impurity were found in an active pharmaceutical ingredient (API). NDMA is classified as a probable human carcinogen (a substance that could cause cancer). The company has not received any reports of adverse events to date related to this recall. The products can be identified by checking the product name, manufacturer details and batch or lot number on the bottle. The company is arranging for return of all recalled products to Qualanex LLC, with instructions for returning recalled products given in a recall letter being sent out. Consumers with questions regarding this recall or reporting an adverse event may contact Torrent at (800) 912-9561 from 8:00 am – 5:00 pm, or by email at Medinfo.Torrent@apcerls.com. For general questions regarding the return of the recalled products, contact Qualanex at (800) 505-9291 from 8 am -5:30 pm (ET).